The image below shows two state of the art topographic images of the moons surface. The image to the left is a Lunar Planisphere engraved by John Russell RA in 1805 based on almost 40 years of detailed sketching and manual measurements using a micrometer and telescope. It is the Moon viewed in full sunlight. "This plate exhibits an accurate view of the lunar disk in a state of direct opposition to the sun, when from the absence of shadow the eminences and depressions are undetermined, and every intricate part arising from local colour or other hitherto inexplicable causes is developed and fully expressed. In a mean state of libration". It is an incredible feat of scientific imagination. The image to the right is from NASA in 2011 - it is an image created from detailed altimetry data and application of information about the phase and libration of the moon (NASA/Goddard Space Flight Center Scientific Visualization Studio). Two hundred years separate these two images. 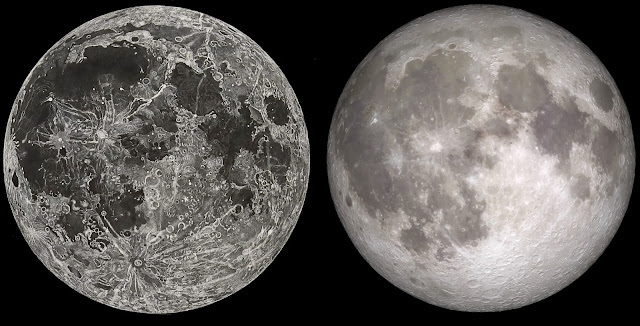 It is remarkable how similar in detail both images are and also remarkable that neither are directly captured images of the moon. The first took Russell upwards of 20 years to engrave and the second is based on a lunar elevation map captured from amongst other things by the Lunar Orbiter Laser Altimeter LOLA.